Fill a steamy shower with soothing, all-natural essential oil scents like lemongrass and lavender. Spa days always leave us wondering, "Where in my house should the aromatherapy steam room go?" Hold off on renovating, because these cubes fill your shower with soothing essential oil scents like lemongrass and lavender. Use as a body scrub, or just place one on a shelf. They're downright lovely to look at–and made with all-natural, vegan ingredients (even the colors are made from seeds, roots, and minerals). Boxed like a selection of sweets, the set makes a deliciously pampered gift for mom or anyone who thinks bathtime should be a ritual, not a routine. Handmade in California. Eucalyptus, Mint, Lemongrass and Grapefruit scents included. I dont have a bath so these are perfect for me... Smell amazing!! I love these steamers... 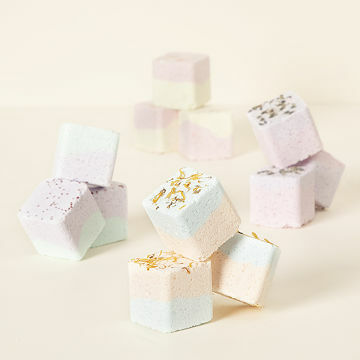 They smell great and I use it as a scrub on my feet..
My impression was that I would put the cubes into a dish in my shower and it would absorb steam and moisture which would scent the room. Unfortunately, you have to hold it right under your nose to smell it. Waste of money.